Quratul-ain, a Kennedy-Lugar Youth Exchange and Study (YES) program participant, talking about her exchange experience. 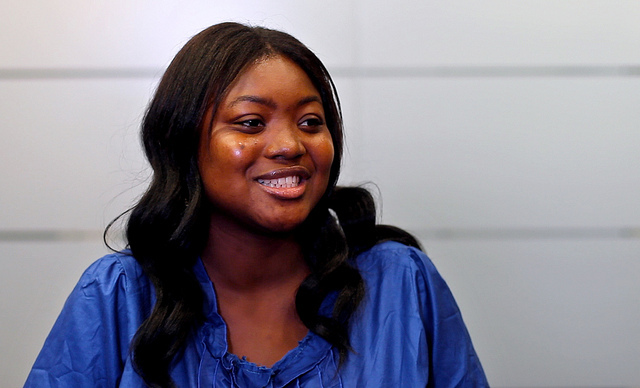 Quratul-ain, a Kennedy-Lugar Youth Exchange and Study (YES) Program participant from Ghana, landed in Jamestown, RI and set out to see what a normal American teenagers' life would be like. "I was excited to have an experience living with an American family, go to a normal high school, have friends, do sports, and do high school stuff," says Quratul-ain. An alternative school style with small classes and a curriculum that included mentoring and volunteer work helped prepare Quratul-ain to follow her dreams. "My high school was actually a very different kind of school," says Quratul-ain. "It was called the MEC [Middletown Education Collaborative] School and it was different from the normal high school in the sense that my school had about two classes [per grade], and each class had a teacher they called 'advisor'. Students were encouraged to do things they wanted to do, so if your career goal was to be a doctor, you were encouraged to take courses or internships that would help give you experience. I wanted to work with children and also in the health sector, so I volunteered at a daycare center and at Newport Hospital. I did that for the whole of my exchange year. It was really a good experience for me." Quratul-ain credits the exchange experience for pushing her to plan more for her future, and to be more independent and organized so that she can achieve her goals. "Before I came on the program I was a really shy person," says Quratul-ain. "I couldn't talk in front of a larger group, I couldn't go up to someone and introduce myself, I was reserved, I was not confident. But because of the YES Program I am confident now and I believe in myself." "I want to work very hard so I can help other people. The program taught me to drive toward my goal. It made me independent because during all this volunteer work I did I had to go to these places by myself and I had to be on time. I had to understand how to coordinate all this with my high school work, with assignments and reports, so I have to coordinate everything together. Back home I do most of these things without even telling my parents! So it really made me independent." "It made me mature too-- in my ways of thinking. It made me open-minded to look at things from different perspectives, to listen to people with different points of view and try to agree with them, and made me tolerant. You have to be tolerant of other people; you have to tolerate other people's behaviors to ensure peace. That's what the YES Program is all about, ensuring peace in the world."